Trumps has been a popular card game in the United Kingdom since the 1970s. Based on the classic card game ‘War’, Trumps is played by choosing your best stat, trumping (beating) your opponent’s card, and winning the entire deck. Each pack of Trumps consists of a number of cards (usually 30 or 32), each of which features in-game characters based on related subject matter which are full of stats, pictures and educational and interesting facts. The game is ideal for multiple players and fits handily in a pocket so can be played anywhere. How to Play Trumps is ideal for 2-6 players. Simply deal out all the playing cards face down to the players. Each player holds their cards face up but is ONLY allowed to look at their top card. The player to go first chooses their ‘best’ statistic (usually the highest) from their trump card, e.g. “Top Speed 180 mph”. All other players then read out the SAME statistic from their card. Whichever player has the highest or best value wins the card from each player and places them including their own to the bottom of their pile. The winning player of that round then chooses the statistic for the next round. During a round, if two or more cards ‘tie’ (or no data is available for that particular stat) then all of the trump cards are placed to one side. The same player then chooses again from their next card. The winner of this hand also takes the cards that were placed to one side. The first player to win all cards is the winner! Trumps is a great game for improving memory recall as the more familiar you are with the pack of cards the better chance you have as you will gain from knowing what particular cards have the best statistics compared to other cards. 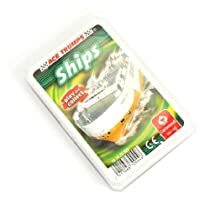 Our Trumps packs have pictures of popular subject matter and are packed with statistics and facts which will help your child improve their reading, maths, and social skills Ace Trumps Collectable Card Games Play and Collect from Carta Mundi.